Here’s a throwback for Friday. Back before the Casino rolled into Windsor and usurped the Art Gallery above for use as a temporary Casino this was the home to the Art Gallery of Windsor, a former converted brewery. Anyone out there have any memories of the place from its Art Gallery Days? Have a good weekend everyone, see you back here Monday. I do remember a couple of visits to the art gallery when it was there. I mentioned to my mom. ..so this is what it’s like to look through rose-tinted windows! I liked the small square windows at the top. ..very artsy to me. Yes. It was a stunning art gallery. The funky windows on the left side had mirrors inside that mixed up the Detroit skyline. And they used to have free concerts on Sunday afternoons up on the second or third floor. And there was a big sculpture on the outside wall made from what seemed like gears and whatnot. They had a miniature version inside that you could use to make donations, and it played music as the coins traversed a maze of nails on the way down. The Art Gallery didn’t move into this building until the mid 70s. I recall visiting it several times from the late 70s until I moved out of Windsor in the mid 80s. I believe that it stayed there until the early 90s, when it was relocated to Devonshire so that the casino could move into the brewery building. Between its lives as a brewery, art gallery, and finally a casino, you can’t say this building didn’t pay its dues to Windsor before facing the wrecking ball. Thank you so much for your perseverance in keeping the site going!! I have referred it to so many people on both sides of the river to enjoy. Such a jewel of a site! 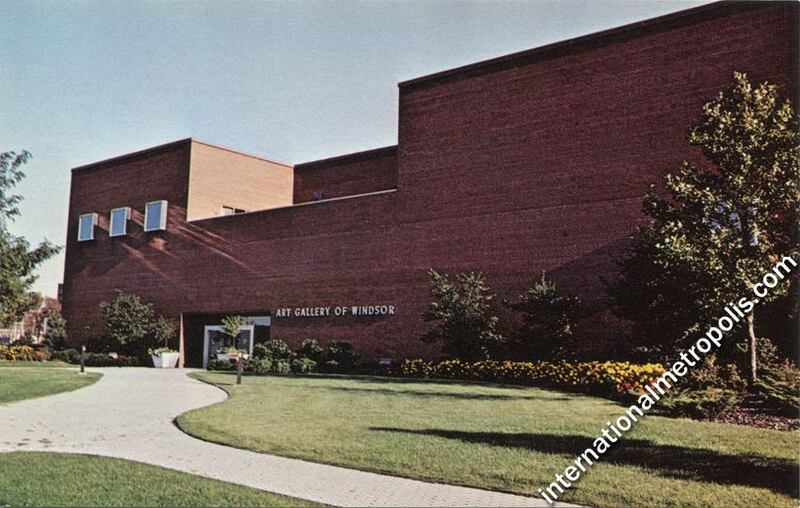 How did the Art Gallery of Windsor acquire it from the Brewery? Was it a bequest from the Brewery owner? Unrelated to this topic, but.I found an abandoned railway passenger coach today in essex county.The metal skeleton is there, approx. 8′ x 40′.East of Holiday beach, and east of the lake Erie Country club is a marsh.A muddy road leads in.Duck hunters are there but not on Sundays.It looks like it is quite old. Maybe late 1800’s or early 1900’s. There are no train tracks near there.I am wondering if anyone knows where it came from.I have pictures i can send.Dave. It’s the carcass of an old interurban streetcar. Was most likely moved there in the 1930s and used as a cottage. I think you are right.There was that street car on West Belle River road that was discovered last year.Probably a similar story.